Freezer 33 je chladič založený na skvělém Freezeru i30, ale s řadou vylepšení pro vyšší výkon a nižší hlučnost. Chladiče je kompatibilní s INTEL 1151, 1150, 1155, 1156, 2011-v3, 2011 a AMD AM4. 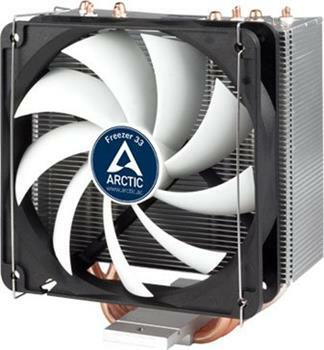 The Freezer 33 is based on the ARCTIC Freezer i30, but features several improvements that boost performance and further reduce noise. Thanks to the award winning cooling performance, the Freezer 33 is the perfect gadget for PC enthusiasts looking for an affordable solution for the CPU cooling. By semi passive performance the Freezer 33 provides again a special feature. A sophisticated fan controller that was developed by German engineers allows passive cooling of the CPU during simple applications such as surfing and creating documents. The F12 PWM fan only starts up at a higher load (starting at 40 % PWM). This not only saves energy but also makes the CPU cooler extra quiet. Thanks to different mounting models for variuous sockets and a significantly lower weight compared to the i30, the Freezer 33 is not only fool-proof to install, but also absolutely transport safe.